Veolia’s drive to decarbonise heat and further the energy efficiency of buildings has taken a step forward following the signing of a new £22 million, 25 year district heating management contract with specialist regeneration and property developer U+I. 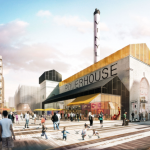 Under the operating contract the new communities on the site in Hayes, West London, will benefit from the energy efficient heating and hot water supplies that will reduce carbon emissions by around 10,000 tonnes over the contract life. 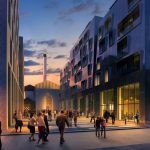 Once home to producing ground breaking records by The Rolling Stones, Pink Floyd and the Beatles, the 18 acre site, known as the Old Vinyl Factory, is becoming a mix of Art Deco office buildings, new homes, innovation and educational hubs, restaurants, shops, gym, cinema and a live music venue. A 4MW central energy centre operated by Veolia will supply low carbon energy to the development’s 585 new homes, and 22,000m2 of commercial buildings and offices. This latest contract adds to more than 30 district heating schemes that Veolia already operate in the London area and builds on Veolia’s recent successes in District Heating and Energy Service Company, ESCO, delivery services. Under the contract the company’s specialist operations and field service teams will provide 24/7 year round support for the energy centre and district heating scheme, operate billing and metering systems, and manage end-user supply agreements. The service also includes system lifecycle funding and risk transfer to guarantee long-term efficiency. The energy centre uses six 927 kW boilers, a thermal store, and a 459 kWe combined heat and power CHP unit to deliver reliable low carbon supplies to the buildings through a 1km pipe network. This will add support to key UK decarbonisation programmes and boosts home energy efficiency, and will ensure that reliable heating and hot water are delivered locally and cost effectively for residents and building users. It will also take pressure off the stretched UK electricity grid. “The energy efficiency of buildings is now key to establishing the sustainable cities of the future, and this development really highlights the benefits gained from a decentralised low carbon energy approach. Through our long term district heating commitment the new community will get the guaranteed, cost effective energy they need.